Until the 1920s, the Hazarbuz lived principally as herders, concentrating on sheep (despite their name, which means “a thousand goats”). 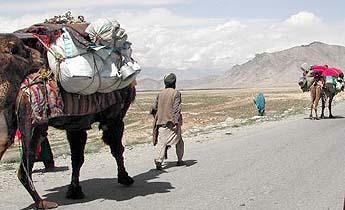 Because their migration routes coincided with a major arm of the silk route, they became more involved in transporting and then trading, typically bringing tea from Bukhara into Afghanistan. As they became more and more successful, an increasing number of households gave up nomadism and settled in Kabul or Helband.